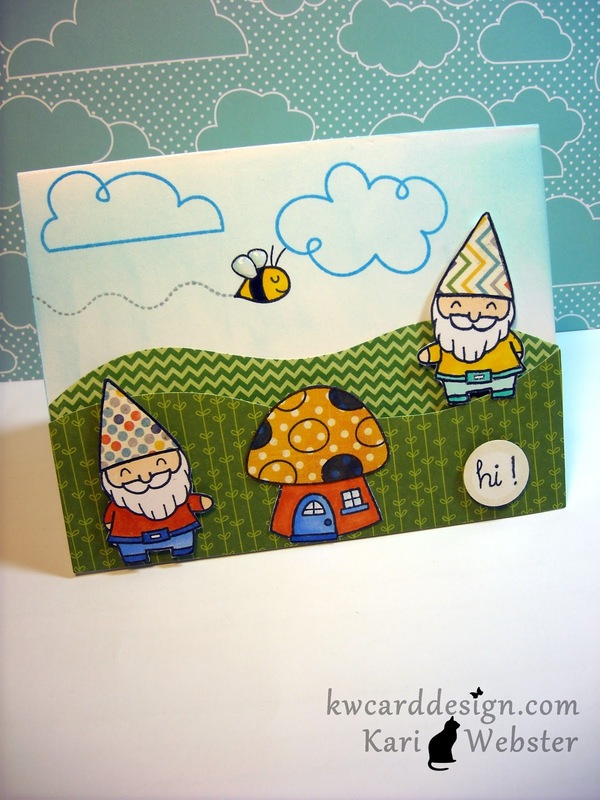 KWCardDesign : Happiness is....Lawn Fawn! Is everyone excited about all the new Lawn Fawn sets like I am! I don't think there is a bad set yet they have released - ( not that I am looking for that of course!) As you can see from my previous post, I received my order from SSS, and my LF goodies all came at once!! I couldn't wait to see how much creative juices were going to flow with my new sets!! So - I wanted to share with you a card I made with Gnome Sweet Gnome. I knew I wanted to create a cute lil' scene with the gnomes saying "hi" to one another, so I used the "mirror stamping" technique. Once you practice this technique a few times - it gets easier. You can't be in a hurry to do this for sure. I colored in the gnomes' with my Copic markers, and paper pieced their cute lil' hats. I also did the same thing with the mushroom house. I also used some of the new LF paper, too - on one of the "hills". To add little something to the bee's wings, I applied some glossy accents. This card screams happy to me. It is whimsical, bright, and full of happiness. There are more projects coming soon with my other new sets. I am currently working on a mini baby album as well, and I will share that with all of you real soon when its complete!! Have a good night everyone! !